Nominations are being accepted for the Marquette University Excellence in Diversity and Inclusion Faculty Award. Each year, the Office of the Provost, supported by the Office of the President, recognizes a faculty member who demonstrates exemplary leadership and that manifests the ideals of diversity, equity and inclusion through practical action. Recipients may demonstrate this commitment across a range of possibilities: student-centered inclusion initiatives; efforts to support recruitment and retention of diverse faculty and/or students; teaching and/or research that expands and embraces our understanding of inclusiveness; multicultural programming or related initiatives; community outreach activities; or several other possibilities. Members of the Marquette community, including students, staff and faculty, are encouraged to nominate one or more candidates. Deadline is December 3, 2018. Candidates should be nominated based on meritorious work above and beyond the duties assigned to their positions. 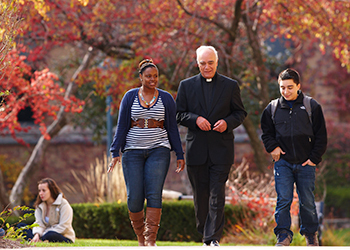 Nominees should also demonstrate and support the Ignatian ideal of care for others, as well as carry out Marquette’s mission and commitment to diversity and inclusion. The Excellence in Diversity and Inclusion Faculty Award will be presented each year at the Père Marquette Award ceremony. Self-nominations and nominations by members of the Faculty Committee on Diversity and Equity will not be considered. Criteria for selection are as follows and may include a broad range of criteria from inclusion-centered initiatives; efforts to support recruitment and retention of diverse faculty and/or students; teaching and/or research that expands and embraces our understanding of inclusiveness; multicultural programming or related initiatives; community outreach activities; or several other possibilities that enhance diversity and inclusion. Nomination letters should focus on the first three criteria and may be supplemented by additional supporting documentation. The extent to which the candidate’s activities have promoted and advocated for a campus environment that is welcoming while embracing and nurturing cultural, ethnic, racial, class, gender, sexual orientation, language, and other human differences. Describe activities that the nominee has engaged in to create and nurture a welcoming environment. The extent to which the candidate’s activities have contributed to raising awareness about diversity and inclusion within the context of the university’s mission and for the greater good of the Marquette community. Describe how the nominee’s activities have raised awareness about the importance of diversity and inclusion within the Marquette community. The extent to which the candidate’s activities had, or will have, significant impact on the Marquette community in terms of diversity and inclusion. Describe how the nominee’s activities have led to or have the potential to make impactful changes within the Marquette community relating to diversity and inclusion. The scope of the candidate’s diversity and inclusion activities reflect a holistic manifestation within the candidate’s dossier (to be prepared by the candidate, once nominated). The deadline for nominations is Dec. 3, 2018. Nominate only one candidate on each form you submit, electronically or by hard copy through campus mail addressed to Dr. William Welburn, vice president for inclusive excellence, Office of the Provost..